In many situations, private investigators need a hands-free, car dashboard mount camera to use during surveillance missions. Dash mountable cams provide a simple solution for capturing video while you’re following a subject on the road, or if you just need to focus on driving. These types of cams can also serve as a fail-safe, capturing video more consistently during times that you may not be paying full attention. Long surveillance assignments can be quite boring at times and it isn’t always easy to stay focused. Having a dash-mounted camera taking video at all times will help capture these “in-between” time periods. The iDrive cam is designed primarily to be mounted on a car’s dashboard, but the tool can be mounted with ease on just about any surface. The product comes with a dashboard mounting kit that includes 3M adhesive tape that securely fastens it in place. The camera is equipped with Pinpoint Laser Aiming, which is an integrated laser designed to help you aim the camera with pinpoint precision. The red laser can be seen day or night to help you specify exactly where the camera will record footage. The product is battery powered, using three (3) AAA batteries as it power supply. This is a notable feature as it does not require power from the vehicle to run, which is perfect for conducting quiet, covert surveillance. The batteries power the device for up to six (6) hours of continuous video recording. 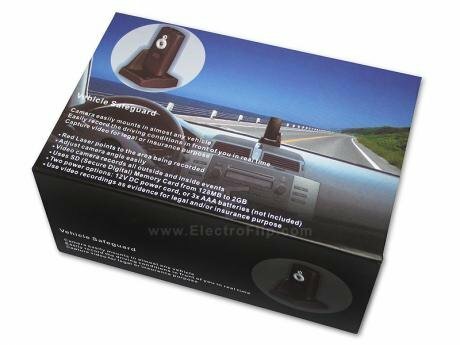 If necessary, the car charger can be used for continuous power, which is more useful for conducting driving surveillance. The dashboard cam records video footage in .AVI format, which is not the most common format. Hopefully, the vendor will support additional file types as they update the product in future versions. You can play back recorded videos on either a Mac or personal computer (PC) using a media player, either QuickTime or Windows Media Player. In addition, the product comes with a set of RCA cables to playback on a television, assuming you have the proper input jacks on your TV. Just connect the RCA cables directly to the device and the other end to the TV and use the controls to watch the record footage. The device comes package with a 32 gigabyte SD card that holds up to 15 hours of video footage. For its specific purpose, we rate the overall storage capacity as good. 15 hours should cover most surveillance jobs. The device offers surprisingly clear QVGA full-color video in 400k resolution at 320 x 240. We rate the overall image quality as good. This product is currently unavailable for purchase.. Visit Amazon.com to find other Dashboard Mounted Cameras. If you have any questions, comments or feedback about the iDrive dashboard camera, please leave a comment below.